I would imagine it is how one interprets it for we are saying the same thing. You are looking at it from a voice coil perspective. I am looking at it from the load the amplifier sees when the impedance fluctuates from the loudspeaker at the given frequencies. If David López Aguilar is playing Reggaeton, he will need bass bins that can reach to 40 Hz with a good amount of efficency. The graph below is the overall measured frequency response of a popular Reggaeton song. Below is the measured result of the Titan 48. 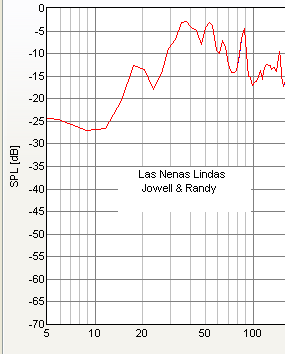 As we can see, the Titan 48 frequency response starts to decline exactly where Reggaeton’s bass is most prominent. Although, David López Aguilar stated he has six Titan 48 bass horns if, six Titan 48 bass horns could not give him what he need, chances are the bass horn is not suited for his requirements. The response offered in the measured Reggaeton track is not an issue for a reflex box (G sub) and, possibly the Hog Scoop David is eyeing. However, it is up in the air where those Eminence fifteens would stand in the Hog Scoop based on having completely different TS Parameters recommended for the Hog Scoop. There are many box modeling programs that will show you a graph of driver excursion vs frequency. I don't know of any program that shows this graph based on anything but a flat drive voltage signal. In other words, when the modeling program shows that the excursion goes through the roof below the box tuning frequency, you can rest assured that the amount of power being dissipated by the speaker VC is of virtually no consequence with regard to this excursion. My opinion jives with Art's; boost below the FB of a vented alignment offers very little payoff and a significant increase in potential damage. Now, an overdamped vented alignment might benefit from some boost right around FB. But even then there is no free lunch. I encourage anyone who wants to play around with boost on their subwoofers to first create a computer model of your speaker and take a look at the expected driver excursion and vent velocity graphs before you dive too far into it. Understanding the differences between thermal power handling and excursion limit will go a long way towards getting the most out of your speakers. Loudspeaker Cabinet Simulators are only as good as the TS Parameters you enter in the software. Literally measuring the TS Parameters of the driver to ensure the figures reflect the manufacturers specifications is the best option. Fortunately, there are programs such as ARTA, CLIO in addition to the Woofer Tester that can make such calculations. The next step would be to literally measure the loudspeaker’s performance in terms of frequency response in addition to the impedance curve in the box under real-world conditions. Once you have created an enclosure around a particular loudspeaker, there is a greater chance of achieving the requirements you are aiming for. Unfortunately, many are not willing to go through the trouble of learning free loudspeaker design software more so getting acquainted with measuring TS Parameters of a loudspeaker. They rather find a design on the Internet, build the box, place speakers with TS Parameters that differ from the recommended driver assigned for that particular box, and hope for the best. Possibly, I am a tad too old fashioned. For the only way I know to determine the thermal or mechanical limit of a loudspeaker is to literally drive the speaker until you smell something is burning, see smoke or hear the voice coil crashing against the back plate.